Move Like a Butterfly Sting Like a Bee!! R·Y·O is a tuning shop based in Hiroshima, who is currently famous for building cars for the sport of drifting. Yoshinaga, a well known drifter in the Kansai region, had decided to start up this shop three years ago. What's special about this place is that they can custom design and produce body kits as well vinyl graphic cutting. Small details are scrutinized at R·Y·O, especially when it comes to the exterior looks of the vehicle. Yoshinaga obligates himself to perform the graphics on a car from start to finish. He sees to it through the entire process from design to applying the vinyl is done his way, the right way. Ever since the opening of R·Y·O, the boys wanted to take on a project that was different from what they have been doing for three years. Here, they took the opportunity to change the shop's image to modifying drift cars by working on various Silvias. The shop had been struggling to receive recognition for their tuning knowledge ever since. Concentrating on the engine performance on the RX-7, the machine was built to perform well on both grip and drift. The engine remains stock at the moment, but a long list of modifications were prepared such as side porting and other goodies to make the car go faster. R·Y·O's demo car defies the whole automotive scene by excelling in car shows, drifting, and grip. The front section is a modified version of the RE Amemiya AD fascia. Can you tell the difference? The custom wide body kit increases the overall volume of the car of more than 10cm. To accompany the kit, 12 inch wide wheels with -45 offset had to be equipped. A staggered setup of 18 inch and 19 inch rims were executed for that killer look. For time attacks, they plan to switch to 18 inch all round. The GT wing was constructed a few years ago after long hours of researching the GT cars a few years back. On the roof and under the wing, fins were mounted to provide good aerodynamics. These were installed with inspiration from GT cars and WRC machines. The shop original dual muffler not only gets the job done but provides that great exterior styling that R·Y·O is always famous for. These are only available for a limited time only. These custom knuckles provide a wider steering angle. Compared to modifying the tie rod, these knuckles are claimed to provide even more angle. The suspension is still under research and development. The rotary engine 13B-REW is mated to a T78-33D turbine. At 1.1 bar of boost, it makes about 400 horses. A V mounted intercooler keeps things cool for a great balance of power and the overall feel of the machine. They are planning to side port the motor to gain even more power. A fuel cell had been installed and secured safely. A roll cage was installed as well as a bucket seat that provides protection to the head. A Stack ST8500 gauge was mounted to display a race car like construction of the machine. We will Build Fast Cars that Look Great!! "I have built the entire car from the engine to the body, and even the graphics. The graphics were made to make the machine look strong and beautiful, with the image of my hometown maple leaf incorporated in the design. This design is our shop original, and it represents the fact that we are going to challenge the entire industry. 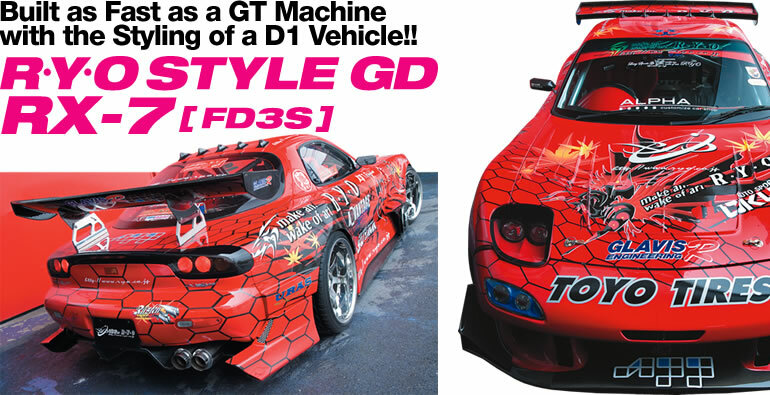 We are even thinking about enrolling in the D1 Street Legal series, and take part in the Tsukuba time attacks as well."